Hello Flawless! 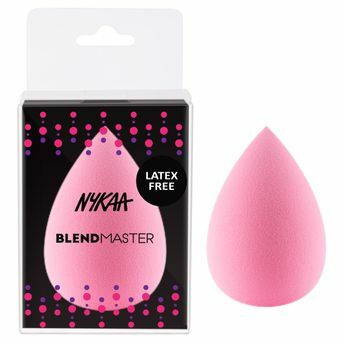 Nykaa BlendMaster All-rounder Makeup Perfecting Blender is a non-disposable, high-definition, latex-free cosmetic Blender applicator that ensures seamless makeup application at all times! The unique tear-drop shape offers optimal grip. The flat bottom can be used with a stippling motion to create airbrushed look, while the pointed end allows for precision in all the small areas of the face, such as around the nose and under the brows. A unique latex-free material has been reformulated to be even more durable and prevent tearing. This miracle Blender works well with all makeup formulations, including liquids, powders, minerals, and even BB and CC creams. It provides streak-free, buildable coverage with faster application than with brushes or fingers. Explore the entire range of Sponges & Applicators available on Nykaa. Shop more Nykaa Cosmetics products here.You can browse through the complete world of Nykaa Cosmetics Sponges & Applicators .Alternatively, you can also find many more products from the Nykaa BlendMaster All-rounder Makeup Blender Sponge range.